Digital art. 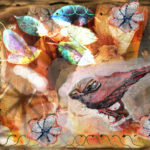 A variety of techniques using a variety of tools, some are scanned images, some are compilations, usually finished in Photoshop, but also using digital scrapbook software at times. A variety of themes. The digital images with a western theme are in-line with my background. This entry was posted in and tagged digital art, original art, photoshop art on June 3, 2013 by sunset1.